Modern day labs are under constant pressure to reduce expenses, improvise lab efficiency and constantly enhance the quality of results. 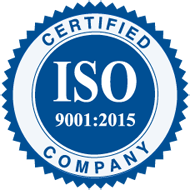 To begin with, it is important to understand what lab efficiency exactly means. In simple terms, lab efficiency is all about how a lab effectively manages time and available resources to improvise data quality, eliminate manual errors, improve laboratory results turnaround time, and streamline lab operations. 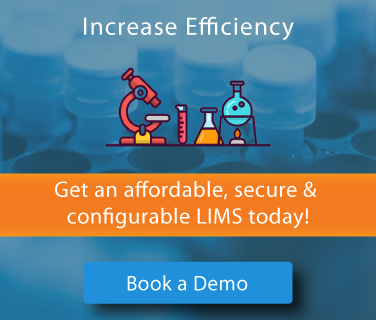 Many labs are interested in improvising their lab efficiency; however, and are not keen investing in cost-intensive Laboratory Information Management System (LIMS) to manage their laboratory data. Labs continue to use paper based systems, spreadsheets, customized in-house developed data management tools, or a combination of these to manage their data. Such labs do not realize the adverse effects of using these outdated data management practices on their lab efficiency. 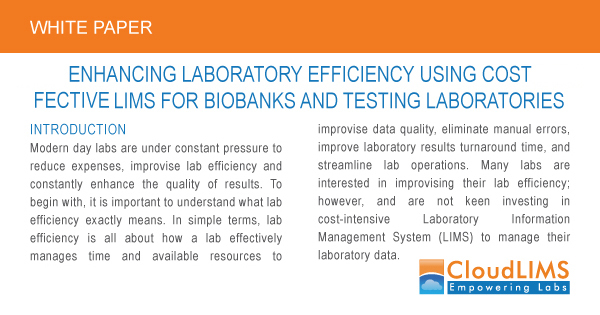 This white paper underlines the challenges faced by biobanks, clinical research, and diagnostic labs and how switching to a cost-effective cloud based LIMS can help to improve lab efficiency by automating various lab processes.